Choose romaine or garden mix. Choose any 2 meats: chopped grilled chicken breast, crispy chicken tenders, buffalo chicken tenders, turkey breast, turkey-ham, tuna salad, chicken salad. Choose any 4 Toppings: Chopped hard boiled egg, bell pepper, purple onion, diced tomatoes, broccoli florets, avocado, cucumber, capers, beef bacon, pecans, strawberries, carrots. Choose 1 type of cheese: parmesan, blue cheese, cheddar. Choose any 2 Dressings: Ranch, caesar, honey mustard, balsamic, blue cheese, russian, fat free tomato vinaigrette. Served with Homemade Croutons and Garlic Bread. Fresh Grilled Chicken Breast on a bed of Crisp Romaine Lettuce, Tomatoes, Croutons and tossed with Parmesan Cheese. Tangy Caesar Dressing served on the side. Katz's Crispy Boneless Buffalo Chicken Tenders on a bed of Garden Greens, Tomatoes, Shredded Carrots, Bleu Cheese Crumbles, Cucumbers and Homemade Croutons. Turkeyham, Turkey, Swiss Cheese, Chopped Egg, American Cheese and Diced Tomatoes over Garden Greens. Grilled Salmon Fillet on a Bed of Crisp Romaine Lettuce topped with Toasted Pecans, Homemade Croutons, Tomatoes and Parmesan Cheese. 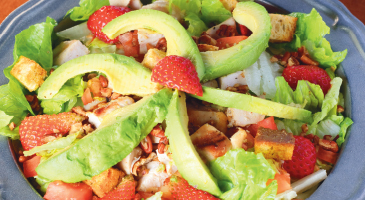 Diced Chicken Breast, Diced Tomatoes, Pecans, Avocado, Homemade Croutons and Fresh Strawberries on a Bed of Crisp Romaine Lettuce. Turkeyham, Turkey, Cheddar, Beef Bacon, Avocado and Diced Tomatoes over Garden Greens. Grilled Chicken Breast, Beef Bacon, Cucumbers, Sliced Avocado, Tomatoes, Bleu Cheese Crumbles and Homemade Croutons on a Bed of Crisp Romaine Lettuce. Garden greens, fajita chicken, shredded cheese, sliced avocado, diced tomatoes, crispy tortilla strips served with salsa or choice of dressing. Add sour cream 79¢ . Two scoops of chicken salad on a bed of mixed greens served with your choice of dressing. Two scoops of tuna salad on a bed of mixed greens served with your choice of dressing.